Релиз лейбла-партнёра GrimmDistribution: новый альбом "Pantheon Arcanum" мексикано-кипрской black/death metal группы Forbidden Rites выходит 7 ноября! 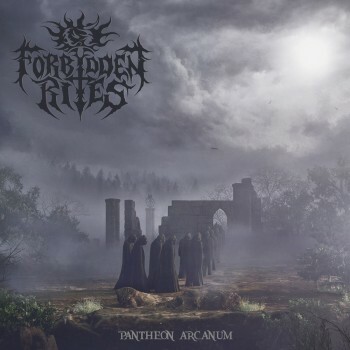 / Release by our label-partner GrimmDistribution: new album "Pantheon Arcanum" of Mexican-Cypriot black/death metal band Forbidden Rites is out on November 7th, 2018! Мексикано-кипрская black/death metal группа Forbidden Rites представляет свой долгожданный дебютный альбом, 9 гимнов истинной, бескомпромиссной, мрачной музыки с убийственным вокалом и неудержимыми гитарными соло, созданными для древних ритуалов, молчавших на протяжении многих лет. Также альбом разбавлен некоторыми мелодичными отрывками, но при этом он не теряет своего разрушительного звучания, характерного для стиля коллектива. С участием музыкантов из Xiuhtehcutli, Ardra Ill и Vomitile. Альбом был записан в двух разных местах: барабаны - в Steel Fortress Studio (Кипр), а гитары, бас и вокал - в Sound Village Studio (Мексика). Мастеринг от Andy Classen (Rotting Christ, Asphyx, Krisiun) из Stage One Studios (Германия). Артворк от Riaj Gragoth из Luciferium War Graphics. Настоятельно рекомендуется для поклонников Dissection, Sacramentum, Lord Belial, Necrophobic. FORBIDDEN RITES - Black/Death Metal band located in Mexico and Cyprus. The band was established in 1996 by guitarist Juan Carlos Martinez (ex-Ardra Ill), guitarist Raúl Campos (ex-Ardra Ill) and drummer Hugo Olivos (Vomitile, ex-Inhearted) under a different name but nothing was released officially. After 20 years of silence, the band decided it was time to unleashed the unconcluded chapter, to create new dark hymns of death. With the addition of longtime friend Vlad Marin (ex-Xiuhtecuhtli) on vocals and bass, the lineup was fully completed. Forbidden Rites music resembles early 90’s acts such as Dissection, Sacramentum, Mork Gryning, Old Man´s Child, Vinterland, Dawn. Lyrically, the band takes their nihilist black texts from the letters of Alonso Guzman (a well-known Mexican writter and a longtime friend of the band) and Sergio Campos. Mexican-Cypriot black/death metal band Forbidden Rites finally delivers their awaited debut album portraying the dark essence of the magic early 90’s, the band unleashes 9 hymns of pure uncompromising blackened music with killer vocals were created in the fall of 2017, obscure and heavy sound to evoke the ancient rituals that have remained silent over the years, adding some melodic passages but without losing the destructive and sharpened sound characteristic of their style. Featuring members of Xiuhtehcutli, Ardra Ill and Vomitile. The album was recorded in 2 different locations: Drums were recorded at Steel Fortress Studio in Nicosia (Cyprus), and guitars, bass and vocals were recorded at Sound Village Studio in Toluca (Mexico). Mixed at Sound Village Studio and mastered in Germany by Andy Classen (Rotting Christ, Asphyx, Krisiun) at Stage One Studios in 2018. Artwork by Riaj Gragoth at Luciferium War Graphics. Strongly recommended for fans of Dissection, Sacramentum, Lord Belial, Necrophobic.